Patricia Hopapp pointed out that libraries are the most democratic institutions left in the U.S. – and they continue to evolve to meet the needs of the digital age. The panel also discussed the changing role library staffs have had to fill – much different from directing people to the right book. 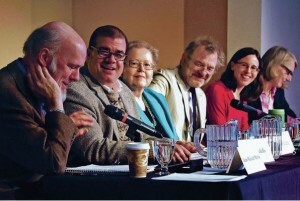 Read more about the Future of Libraries panel in an article by Staci Matlock in the Santa Fe New Mexican.